Laminate floors are elegant, affordable, and they keep your feet warm. The only problem is that they are notoriously difficult to clean. The surface of laminate planks is totally water-proof, but the edges are not. This means that a badly laid laminate floor can easily get ruined by water. Related: Check out our article on the best types of laminate flooring, complete with reviews and comparisons! When water seeps into the gaps between the planks, it is crucial to wipe it away immediately. Prolonged wetness – lasting 4 hours or more – can seriously damage the flooring. This means that steam mops should not be used on laminate, and wet mopping becomes an exercise in caution. A wet mop can damage your floor, so your option are to make sure your mop is only slightly damp and does not drip water into any gaps – or to stick to dry mopping and vacuuming. But these methods will not help when it comes to stubborn stains, and they will fail to efficiently kill germs. To achieve a truly clean floor, disinfectants are necessary. Again, the nature of laminate floors makes this a complicated choice. Soap and soap-based cleaning products make the planks look dim and sticky, and they actually attract more dirt that way. Any abrasive cleaner is going to cause problems. That’s why specialized laminate cleaners are the best choice. The selection available on the market is rather large. Some are efficient, some are a waste of money. 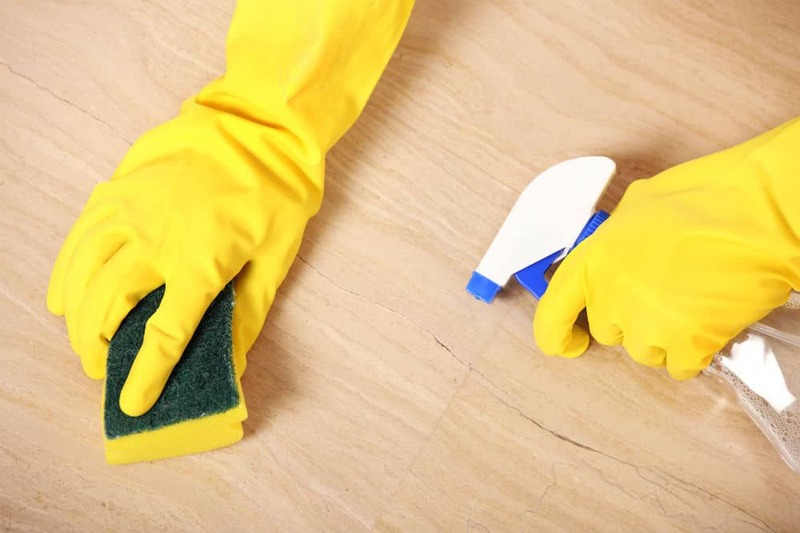 When you’re looking for the best cleaner for laminate floors, the following three cleaning products are worth considering. Here is a product created with ease of use in mind. You just need to spray this cleaner on your laminate floor and then wipe it away. No rinsing required! Good Housekeeping tested the Black Diamond Wood & Laminate Floor Cleaner on a pre-finished wooden floor with sticky and hardened food stains. The product was found to be very efficient, and cleared the test surfaces entirely at every stage of the experiment. This is a biodegradable and eco-friendly cleaner, and it is safe to use around children or pets. It does not have a strong smell, and it is designed to be hypoallergenic. The bottle comes with clear instructions. The Black Diamond Floor Cleaner is suitable for both laminate and hardwood floors. It does not damage wood and never leaves streaks, scuffs, or any residue, so you don’t need to go over the same area twice. One notable downside of this product is that it does not bring out the natural shine of laminate floors. In fact, it dims the surface of the planks. This cleaner is great for quick and easy cleaning. It is worth mentioning that you should put aside a special mop or cloth to use only with this cleaner, as it stains cleaning cloths and equipment. This product is one of the best cleaners for laminate floors and great for use on particularly tough stains. The spray is very easy to apply and comes with a ready-to-use formula. After spraying the stain, you just need to wipe it away. No rinsing necessary. According to Good Housekeeping, the Bruce Hardwood & Laminate Floor Cleaner Spray is particularly efficient in removing soil from your floor. It is effective on any kind of stain, while also recommended for routine cleaning. Scuff marks are a downside. It takes multiple passes to remove scuff marks completely. This can make it an unpopular choice for users who prefer not to go over the same area more than once. On the other hand, this laminate cleaner is designed to bring out the natural shine in your laminate floors. It does not leave any kind of film or residue. This product is suitable for both laminate floors and no-wax hardwood. Your floorboards will look as good as new! Considering its ingredients, the Bruce Hardwood & Laminate Floor Cleaner Spray might not be safe to use around children or pets. Now for another environment-friendly option! Also one of the best cleaners for laminate floors, it is based on vinegar and essential oils. Every ingredient is guaranteed 100% replenishable and natural. Because of its vinegar content, it is recommended to wear rubber gloves while using this product. No animal testing was used in the production of the Earth Friendly Products Laminate and Hardwood Floor Cleaner. It is enzyme-free, and free of petroleum-based chemicals, as well as phosphates or chlorine. Using this product does not require rinsing. The cleaner adds a natural shine to both laminate and hardwood floors, and it does not need to be combined with anything else. A frequent concern when it comes to using all-natural product is the smell. But Earth Friendly Products Laminate and Hardwood Floor Cleaner is infused with lemon essential oils, leaving no unpleasant odor. It is worth noting that, because it leaves a shiny finish on your floors, using this product results in extremely slippery floors. This may cause injury, so the product is not recommended for high-traffic areas. Leaves a wax finish – slippery! It is clear that there are distinct advantages to each of these products, and the right product depends on the buyer’s specific requirements. For buyers looking for a particularly robust and efficient laminate floors cleaner, the Bruce Hardwood & Laminate Floor Cleaner Spray is a solid choice. It is suitable for use around the house and for professional cleaning as well. If you’re looking for a 100% eco-friendly, cruelty-free product, the Earth Friendly Products Laminate and Hardwood Floor Cleaner might be the right choice for you. This vinegar-based cleaner can take on most stains and comes with bio-degradable packaging. Taking into account factors such as efficiency, user-friendliness, and environment-conscious production, the best laminate cleaning product is the Black Diamond Wood & Laminate Floor Cleaner. 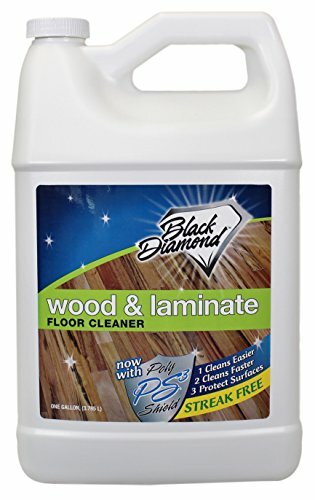 The Black Diamond Wood & Laminate Floor Cleaner is safe to keep around the house, and it was created with the environment in mind. It can easily defeat the toughest stains and does not leave any scuff marks. This is a good choice for both laminate and any kind of hardwood flooring.